But a real ariel seemed way too dangerous, and, despite his urgings, I had no idea how to spot him, a fast-moving target plunging his head toward the ground. 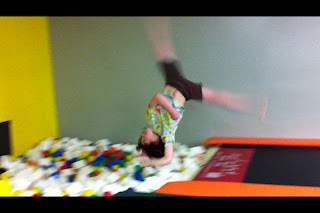 One day I took him to "open gym" at a kids' gymnstics place and got a rad idea while looking around. I suggested he try an aerial over the ball pit. First, I moved all the white sponges to one side, on top of his section of balls. So he could land soft--er. Was he game? He ran down the tumbletrack, pop-hopped and flipped. It was the first, most memorable aerial. Since then he has been walking on air.